“And it came to pass on the third day in the morning, that there were thunders and lightnings, and a thick cloud upon the mount, and the voice of the trumpet exceeding loud; so that all the people that was in the camp trembled…and the Lord called Moses up to the top of the mount; and Moses went up.” Exodus 19:16, 20. My hike to that mountain was a lot less dramatic and more unnoticed than Moses’. There weren’t thunders and lightnings, or multitudes of people waiting for me to come back. But despite that, I didn’t miss my encounter with the deity, which was more like the “still small voice” that Elijah describes. And just to clarify, the precise location of the original Mount Horeb is unknown. 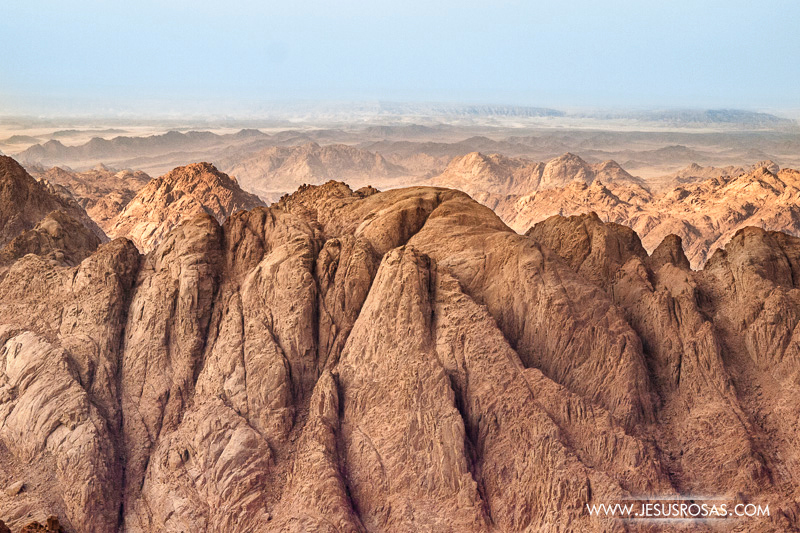 Among the few different suggested locations are the highest peaks in the Sinai Peninsula in Egypt. 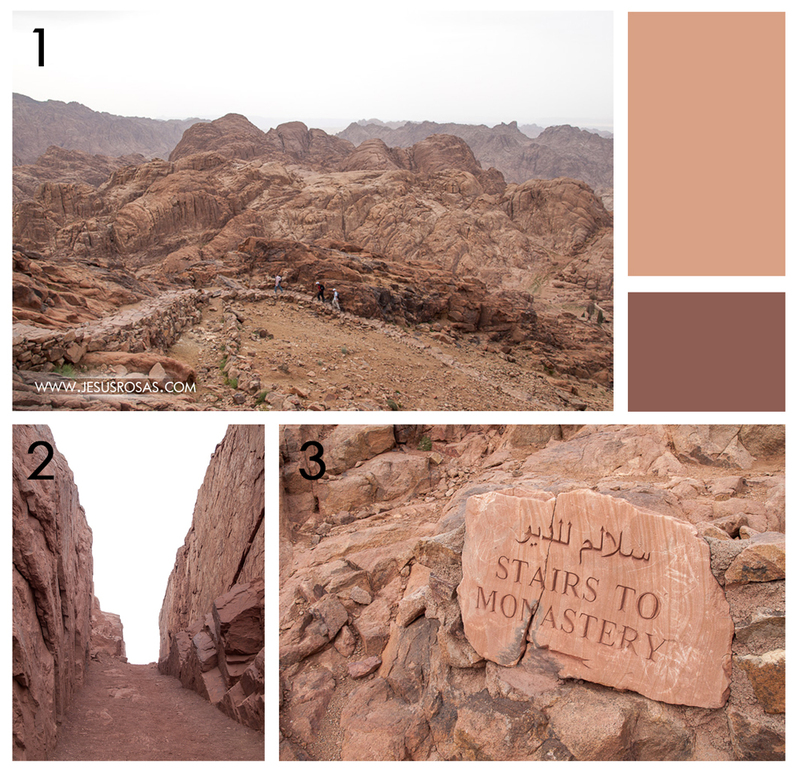 Today we know it as Jabal Musa (meaning Moses’ Mountain in Arabic) or Mount Sinai. It was a sunny and warm May 2. I was on a trip with several university classmates. Around 3:20 pm, Cairo’s time, we gathered at a temporary base just a little farther from a monastery. I saw the tallest and most athletic classmates near a young Arab who was wearing western clothes. His skin was notoriously tanned by the Middle Eastern sun. I soon found out he was the guide who was already giving instructions. Among his indications I remember that we could go at our own speed, alone or with someone else, but we shouldn’t leave the marked trail. While listening to this, I told myself that it would be a relatively easy hike of no more than 2.5 kilometers (8,202 feet). Moreover, the hike wouldn’t be that steep, except for the last part that were some 700 uneven stair steps. 1. Camel posing on the start of the trail to Mount Sinai or Jabal Musa. 2. Part of the landscape on the trail. The guide and four or five of my classmates began walking with fast and giant strides. Behind I could see those with less favorable physical conditions. I tried to be fast until I realized my huge disadvantage. I was carrying my backpack with my laptop, an external hard disk, my tripod, my camera, camera lenses, cables and I only knew at that time what else I had inside. All these things increased the weight of my hike. With a successful attitude I convinced myself that I would make it to the top easily. The first part wasn’t steep. There were rocks and dirt everywhere around. There was almost nothing I could call vegetation. The trail seemed all the same zigzagging among rocks and small elevations. At first I thought it would be easy to just break the rules briefly and cut the trails. I ran upwards in a straight line meeting the trail path again. I did it a few times, saving some extra walking. In one of these shortcuts, I surprised those who were on the front. One of them told me that I hiked mountains like a goat. It wouldn’t be for long, the weight on my back and my eagerness to move very fast across rocks began to take a toll. I soon would begin hiking as a turtle, slow; plus carrying a heavy “carapace” (my backpack)… you get the picture. I slowed down a couple of times and, as the height increased, I started to see more the landscape. I took pictures here and there, but almost everything was the same. Dirt and stones. At a certain point I passed a Bedouin checkpoint. It was made out of fabric, wood and rocks. “Salam!”, I greeted them. They replied and smiled calmly while watching me. They continue chilling and relaxing. Farther up I would see another Bedouin here and there selling water or offering camel rides. Their rhythm of life seemed slow and easy going. And at least for them going up and down didn’t seem a matter of rushing or competition. But on the other hand, I speeded and ran whenever I gained strength back to bear the weight on my back even though I really didn’t have a reason to do it. 1. 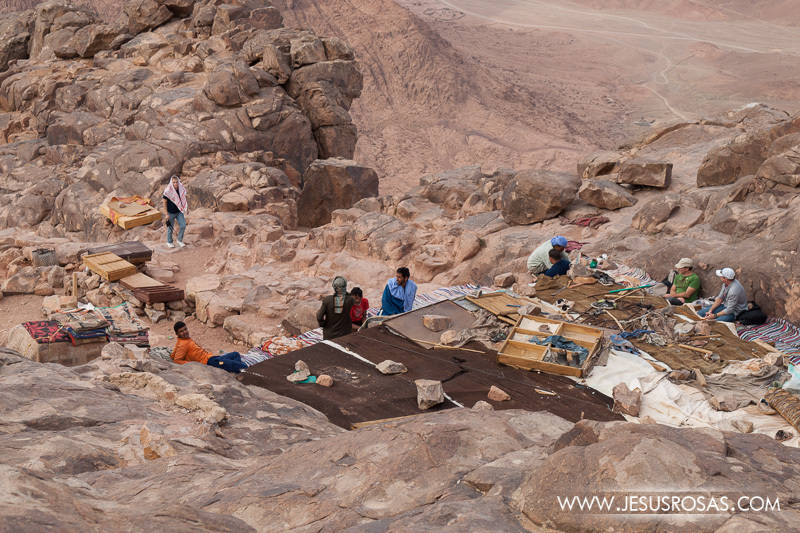 A Bedouin on a camel riding on part of the trail that leads to Mount Sinai. 2. A couple of tents of Bedouins. 3. The trail and empty landscape made out of dirt and rocks. The landscape was almost the same until I got to a narrow trail crossing between two big rock walls. It looked as if the mountain had been cut in two to let the trail go through. There was less loose dirt and stones. Instead, there were more solid rock formations. Next I passed other camps of Bedouins. I continued forward, but without running and with some short breaks. The path was now less twisting than before. The trail had some sections going through big rocks with less predictive bearings and a couple of bifurcations here and there. 1. Some of my classmates on a stone trail. 2. Part of the trail that goes across a mountain. 3. A sign in Arabic and English. 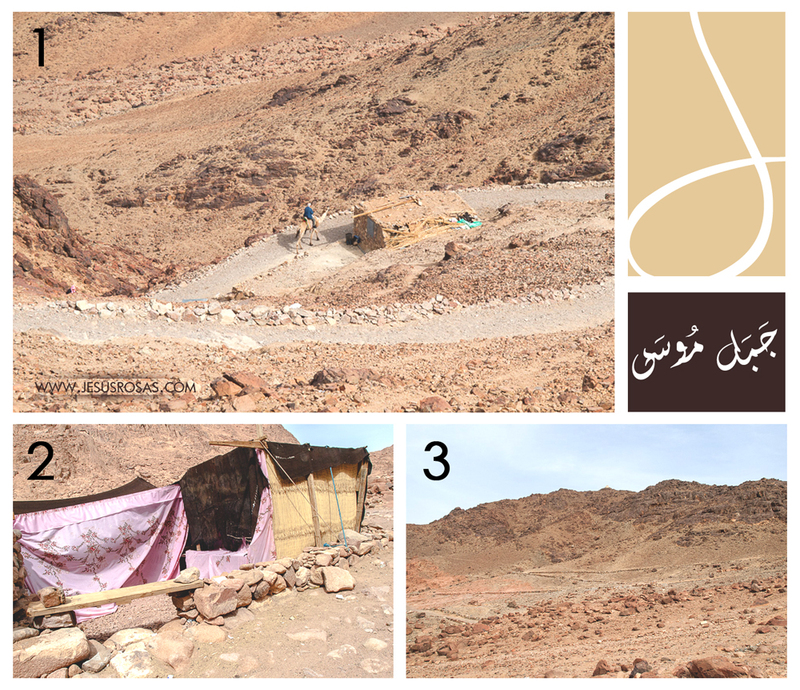 In this picture you can see another Bedouins’ camp base.along the trail. During my walk, I was passed by some of my classmates then I would pass them back and vice versa. At this point in my hike, the weight of my backpack was becoming really tiring, but even worse, it started to become painful. I started to feel the weight especially on my shoulders and knees. Once I arrived at the stairs of 700 steps, I decided to climb them as fast as I could. During those days I used to climb stairs running and skipping two or three steps so I wanted to try it there. Few meters (or feet) before reaching the top, my knees started to shake. My kneecaps and knee tendons and muscles started to burn. I also felt as if something were pulling me down. I resisted. With camera and tripod in hand, I kept on going. My shoulders hurt because of my heavy backpack. During a moment I started to feel that my feet weren’t able to reach the height of the next step. I slowed down even more, but still determined to not stop for more than a few seconds. And every time slower after a self-forced and no-resting sprint through the long stairs, I finally made it to the top. Right after the last step, I pull out my chest and walked with my hurt and unstable knees towards a small chapel on top of the mountain. I felt the fresh air, I approached my classmates and left my load on the ground. I felt released. 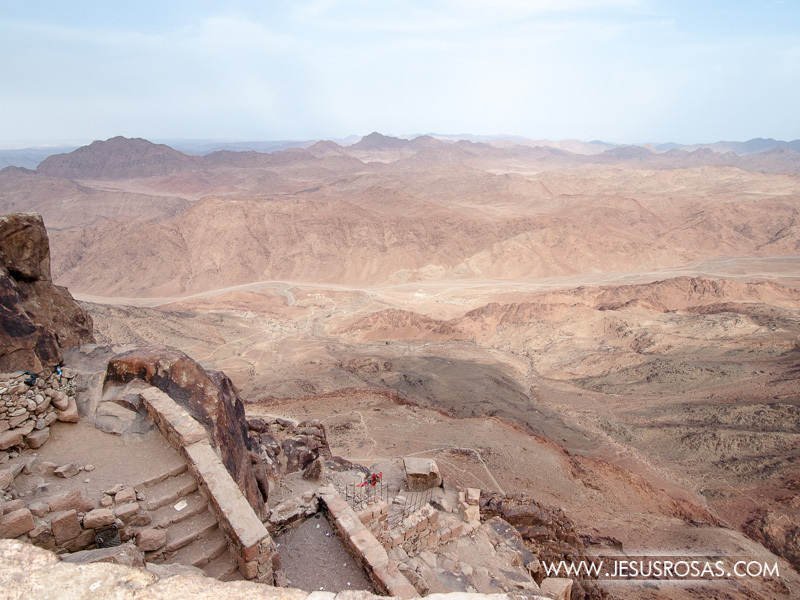 On the left bottom you can see part of the stairs that lead to the top of Mount Sinai. Not all stairs are as nice, flat, and even as the ones you see here. Once on the top I joined my classmates. We all looked around, we talked about what we saw. We joked, we took pictures, we rested and some left while others arrived. Among all that, it was interesting to see one of my classmates using his cellphone. Of course, I would have done it too, if I had signal AND international coverage. It would have been fun to call someone back home to say, “hi, how’s it going? 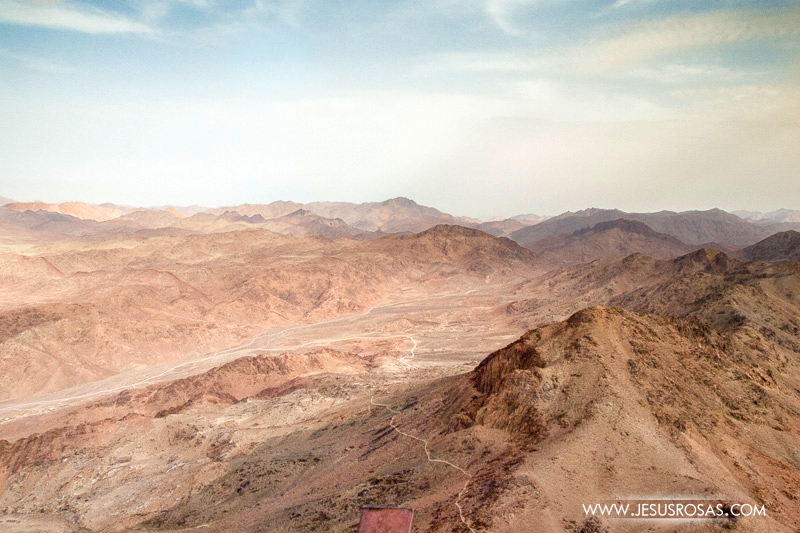 I’m calling you from Mount Sinai in the Sinai Peninsula in Egypt. What are you up to?” Lol. 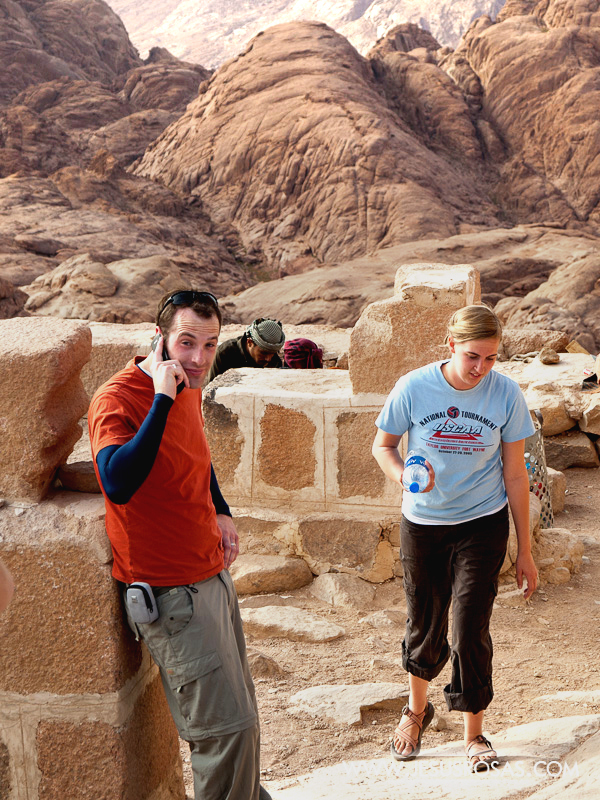 One of my classmates calling his wife from the top of Mount Sinai. 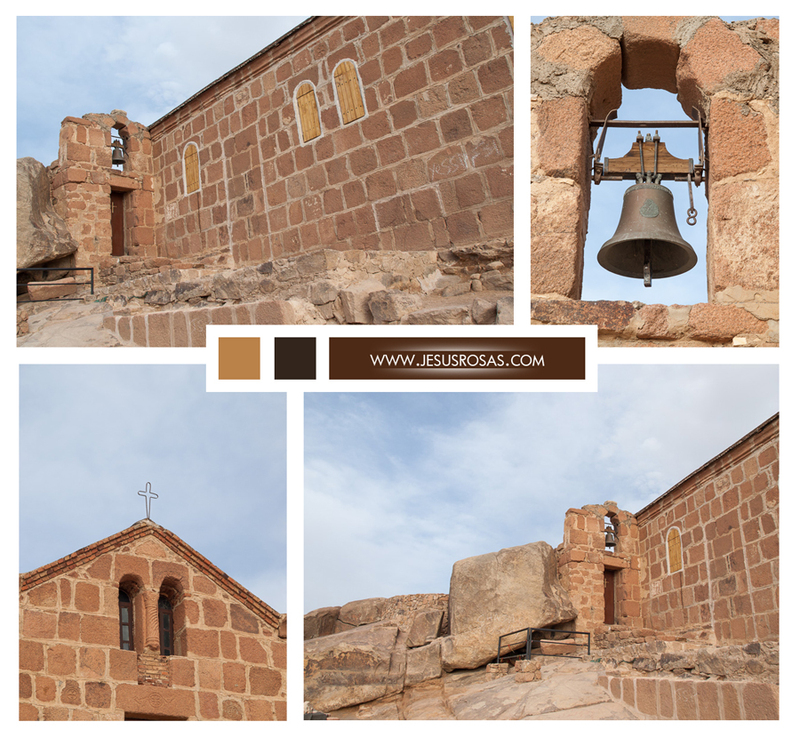 After exploring, I peeked inside the small chapel built on the top of the mountain. I saw some paintings. Today I know that the small chapel is named the Holy Trinity and, supposedly, it was rebuilt in 1934 on top of the ruins of a church from the 4th and 5th century . There wasn’t much to see, but I wondered why the chapel was closed. There may not be enough people to manage it. In other places, someone would hire some people to guard it and even charge to see those old paintings. Chapel The Holy Trinity on top of Mount Sinai. 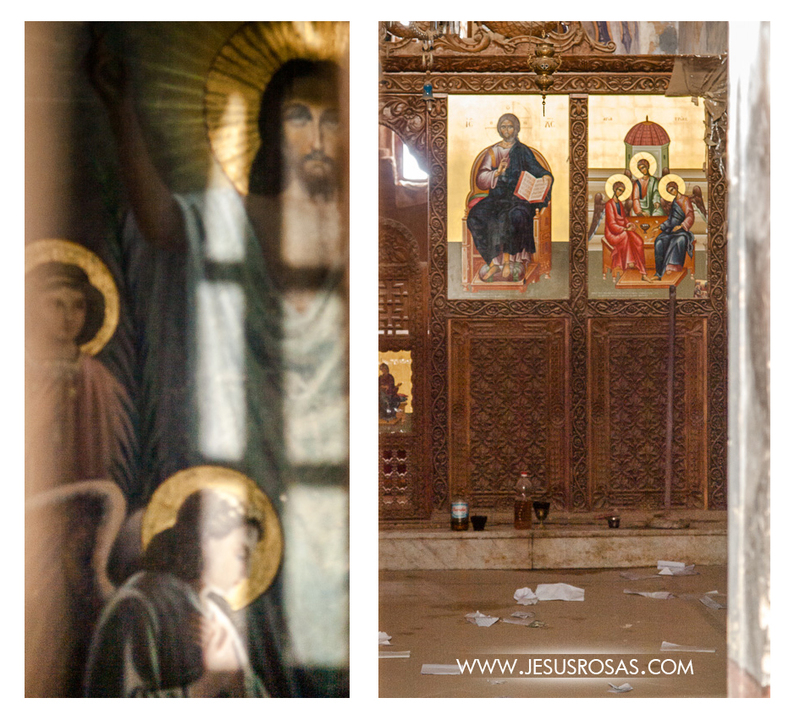 Pictures of the paintings inside the chapel The Holy Trinity on top of Mount Sinai. The doors were locked. I took these pictures peeking through some small open spaces. 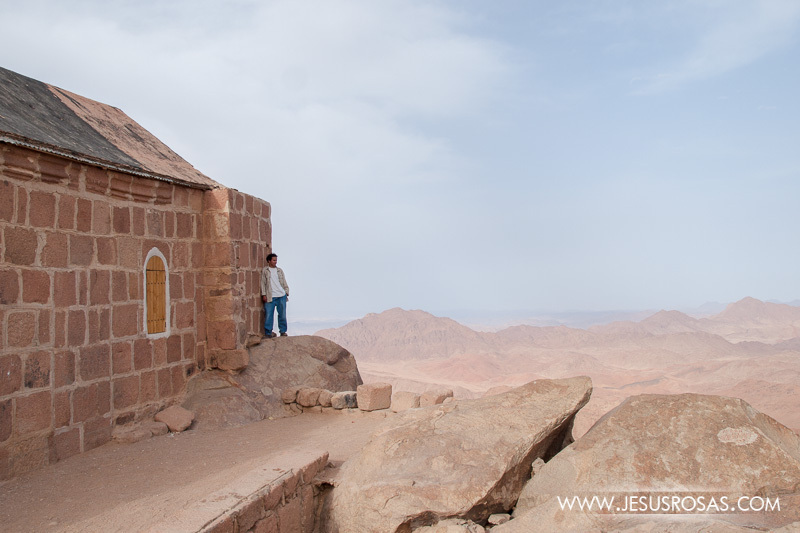 A picture of me next to the chapel on top of Mount Sinai. I was at the top when some more classmates came even our teacher and his wife. We then took a quick moment for a group picture with our teacher Dilworth Parkinson. A group picture with my teacher Dilworth Parkinson (center wearing a dark blue polo shirt) and some of my classmates on top of Mount Sinai. And I’m also in the picture when I had longer hair at that time (second on the left). I also took a minute to capture this cat that seemed to be living there. It was probably fed by tourists and Bedouins. After a few minutes when my teacher and most of my classmates had left, I took a moment to sit on a wide surface without people around. I watched the great view in front of me. I ponder about those passages of Moses speaking to God and receiving the law. I also thought about the burning bush and Moses taking his shoes off. I offered a silent prayer and thanked God. Now my eyes were opened and it wasn’t an ordinary hike with friends anymore. It was a moment to appreciate the meaning of what that place could be. We may not know the exact location, but when looking at the other mountains and the vast sky, I realized again how small I am and how great The Author of all things is. Being there also made me think of the Ten Commandments. And also today, I can ask myself, how am I doing? Do I keep them? It was a precious moment to think about those and other more personal things. It was then that I felt a moment of peace, tranquility, and hope. It was a true “still small voice” talking to my heart. And you? Do you remember what the Ten Commandments are? You can read this external link that has a list of the Ten Commandments with a brief definition if you want to. And to conclude, that’s how it was my hike to Moses’ Mountain. The return to the base was a lot less complicated. I arrived at our original meeting point around 6:45 pm. It shouldn’t have been really that complicated. What made it difficult was my load and wanting to rush and cut the trails. That made things harder in terms of strength to reach the top. Sometimes life is like that, we may carry extra load when we don’t need to. It may be physical, mental, emotional, or spiritual loads, you name it. We also try to look for other paths that may seem faster or give us faster self-gratification, but at the end they may complicate things. We may forsake the right path of those good principles we are taught, the good advice, the laws, or positive role models of those who have more experience than we have. But on the other hand, hiking Mount Sinai hasn’t only been the most complicated hike of my life so far, it has also been the most rewarding and meaningful one. Not so much because of the view, but for what it represents, the lessons I learned, and above all, for all what I experienced in a moment of calmness, serenity and placidity. It is something that at the end of all we cannot comprehend or understand. We can only say that it has something to do with faith. And for you. What has been the most difficult, interesting, and/or meaningful hike of your life? Share it below in the comments section. 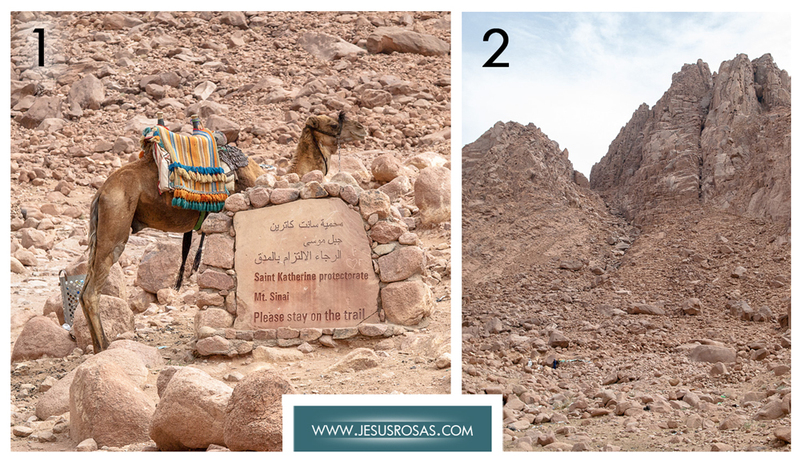 If you want to read more information about hiking Mount Sinai, you can check out the Mount Sinai, A Walking Trail Guide, which is an external link. If you would like to receive a notification about new content in this blog, click on the subscribe button below and enter your email address. You can always unsubscribe in case you later change your mind. If you liked this post, click on the Facebook or Twitter buttons below and share it. 1 Kings 19:12 James King Version. Bolen, Todd. 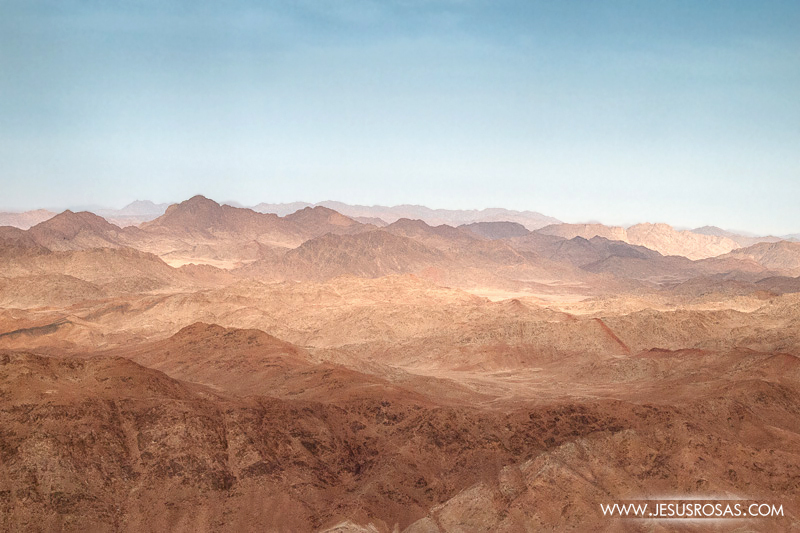 “Jebel Musa (Mt. Sinai? ).” Bible Places. Www.bibleplaces.com, n.d. Web. 10 Apr. 2015. <http://www.bibleplaces.com/jebelmusa.htm>.